Flamingos are one of the most popular and well known beautiful birds across the globe because of its red-purple coloured feather. They love to thrive in shallow lakes, mangrove swamps and sandy islands of Africa, Asia, America and Europe. It is also popular as one of the most colorful birds because of the beautiful pink shades it has all over teh feathers, Now you must be thinking Why are flamingos pink? and not appear in other colours. We will explain about this in later paragraphs, howvever, lets first discuss some of the facts about this migratory bird who love to India from Siberia during the winters. 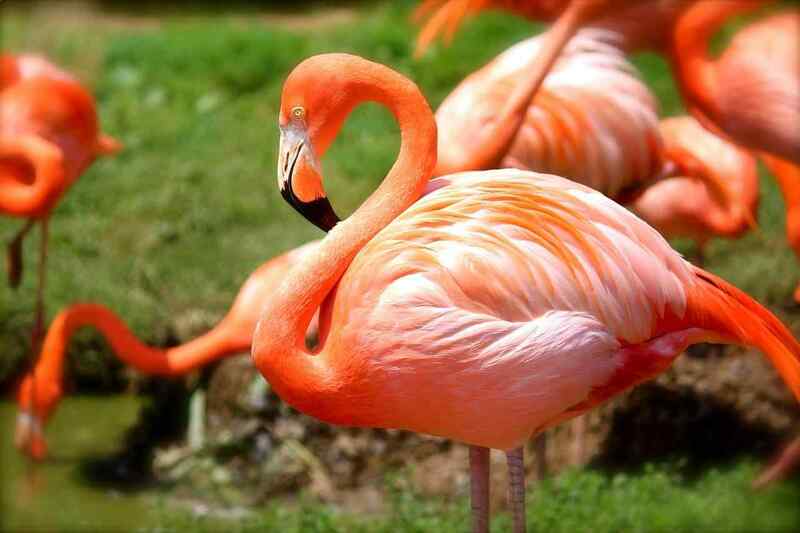 An adult Flamingo can grow upto 3.3 – 4.6 feet tall and weighs approximately 3.3 – 9 pounds. The unique feature if that when they eat their head is positioned upside-down because of their sick water and filter the food. Also, flamingos hold their breath while feeding and during migration, they are capable of travelling over 300 miles to reach their new habitat with an average speed of 37 miles per hour. One of the beautiful pink animals spends around 20% time cleaning their feathers because there is a special gland that produces oil and it gets spread over feathers with a help of their beak. Mostly these birds appear in large groups known as colonies and some colonies can contain around million birds. The monogamous bird species (just have one partner) can produce one egg each year. Both male and female species together keep the egg warm before it hatches and after few days both parents start feeding their chick with milk-like substance rich in fats and proteins. Naturally, baby flamingos dont have a curved bill but later it becomes curved. The bird species stays on one led when they want to rest and the visible “knee” of the bird is actually ankle joint which is quite close to the body and can’t be seen because of the beautiful feathers. They have an average lifespan of 20 and 30 years in the wild. Now, let’s discuss Why are flamingos pink? the answer is they are not pink, instead, they have grey feathers when they are born that later turns in to pink in the wild because of a natural pink dye called canthaxanthin that they obtain from their diet by eating brine shrimp and blue-green algae. The bird species that are kept in zoos loose their pink colouration because of the absence of canthaxanthin to their diets, howvever, caretakers add synthetic canthaxanthin to teh diet of the beautiful bird species to maintain the colour combination. It loves to eat shrimps, algae, crustaceans and other species in the wild. This is the reason Why are flamingos pink?. Do post your comments.